My favorite season is Autumn in Queanbeyan, NSW, Australia, where I grew up. Queanbeyan is practically next door to Canberra, the capital of Australia. Many people who are not from Australia do not know that Canberra is the capital of Australia, let alone heard of Queanbeyan. I didn’t come to fully appreciate the place where I grew up until after I left it. I left at the age of 18 and returned to live there again when I was 24. When Autumn came around that year, it was then I saw how spectacular the changing colors of the leaves on the trees were, and felt how pleasant the days were. I think Autumn that year left an everlasting impression on me, I still remember some of the vividly colored dreams I had of deep golden trees, their leaves rustling in a soft breeze, and me sitting near a house on a dock near a river or lake. 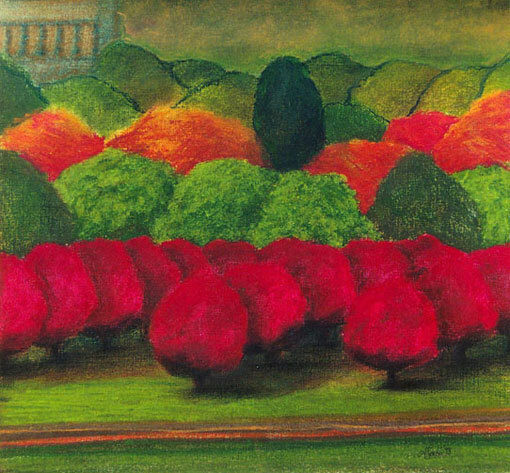 If memory serves me correctly this pastel drawing is of some trees on Parkes Way, Canberra. I am looking at the scene from across the lake near the High Court of Australia.